I couldn't resist just a little nod to Halloween today in the shape of these spooky little treats. Halloween is probably the best 'holiday' or occasion for themeing, there are just so many ways to make things look a bit creepy! 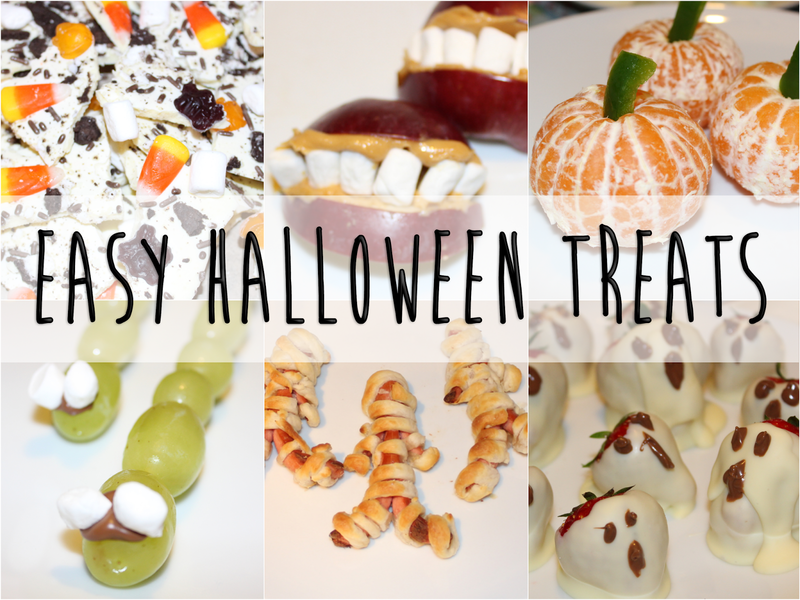 If you fancy a bit of last minute spooky action, all of these treats are super quick and easy to throw together, and most of them are pretty healthy and kid-friendly too. It doesn't come much easier than these cute little faux-pumpkins. Who knew a peeled satsuma could look so much like a pumpkin with the addition of a little slice of green pepper?! These gruesome teeth and lips can be thrown together in seconds too. It's just sliced up red apple, a smothering of gooey peanut butter, and mini marshmallow teeth. Mmmm gory! My creepy caterpillars are just grapes threaded onto a wooden skewer with halved marshmallows stuck on with melted chocolate. Embarrassingly easy! If you've got a little more time, these terrified strawberries and a yummy treat. I just dipped strawberries into melted white chocolate without being all that precise, as it gives them more of a wobbly, spooky look. Then I splodged on some melted chocolate to give them haunted little faces. Okay I can't claim that this one's healthy, but it looks pretty cool, and you can use whatever sweets you have on hand, the weirder the better! I melted down some white chocolate and spread it out thinly on greaseproof paper before topping with crushed oreos, candy corn, marshmallows, chocolate ants and Halloween Haribo jellies. This would also look cool with some green and purple sweets, or Halloween shaped sprinkles. Once it's all hardened, you just break it up into spikey chunks. I hope this gave you some good ideas if you're planning to up the creep factor of your food today or over the weekend. Have a spooktacular Halloween! Awww...they are all so cute! how creative people who have done these. Happy Halloween! Oh wow these are so cute! and look so yummy!